Will your tan be ready? * Sessions can not be shared. Offer for students only. * Spray Tans must be used 1 year from purchase date. Perfect to get get ready for that special event! * Level 1 bed. Special requires purchase of tanning lotion greater than $35. *New Customers Only. *Tanning eyewear is required! Bring your own or purchase from us. It’s the law. * Level 1 beds. Amount must be paid upfront in a single payment. No refunds or cancellations. A great way to balance your desire for a great tan and stay within your budget. The Sundash 32/1 has a basic cooling system that makes your tanning experience a mini vacation. Our Level 1 package is a step above the rest. Don’t settle for outdated and unmaintained clam shell beds. We stepped up to set the bar for what a level 1 bed should be. Access to this level can be purchased as sessions, 30 day pass, or Membership with unlimited tanning. Valid phone number and driver’s license (or state ID) required for purchase. You must be 18 to UV Tan. The Level 2 tanning package offers access to both the Passion and the Sunrise stand up unit to round out your tan and mix in some variety. The Passion has a comfort cooling system that is superior to higher end tanning beds and it provides a personal stereo system. The openness of a standup booth provides a more thorough tan offering a more even color across your entire body. Because you don’t touch the acrylic there are no pressure points that cause some areas not to tan. The openness of a stand up booth provides a more thorough tan offering a more even color across your entire body. Because you don’t touch the acrylic there are no pressure points that cause some areas not to tan. We have 2 of these units in our Wake Forest location because they are popular with our male tanning clientele. Tanning Power – 48 X 200 watt (2M)Smart Performance UV Lamps. This bed sets the standard for comfort with air conditioning, a large bed area offering a cool relaxing tanning session from start to finish. The Wake Forest location has 2 Inspiration 450 sunbeds because of their popularity. Comfort –1-system body ventilation, variable with air conditioning. – 42 x 200 watt Dynamic Performance body lamps. – 4 x 400 watt Ultra performance Plus Facial tanner lamps. The Esprit 770 is equipped with High pressure facial technology. Complete body fans, air conditioning, misters, shoulder tanners, as well as side tanners to help eliminate pressure points. The larger beds allow movement and ensures ultimate comfort. Comfort – Adjustable Air Conditioning, Adjustable face fans, Temptronic climate control maintains the preferred temperature throughout the tanning session. – Aqua Mist & Aroma for refreshing relaxation. – 48 Dynamic Power, 200-watt UV lamps for a deep body tan. – 4 Ultra Performance 500-watt facial tanners with glass reflector system. – 2 high-pressure 240 watt shoulder tanners. The Ergoline Open Sun sunbed demonstrates how powerful, yet at the same time cool and airy, high-pressure tanning can be. If you are tanning and need a boost for an event, when you use this bed you will see quick results. Often times the difference is noticeable at the end of the session because High Pressure tanning produces UVA light which tans deeper and produces a darker tan. We offer both the Esprit and Open Sun in the level 4 package to provide a mix of UVA and UVB tanning to balance a deeper level of pigmentation. This means you can tan less with a longer lasting tan. 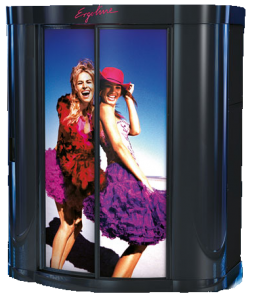 The Ergoline Sunstyle sunless spray tanning booth offers a multi-pass full body spray with multiple solution options as well as 4 levels of color. All solutions contains anti-oxidant fruit extracts and black walnut extracts that leaves your skin feeling moisturized and beautifully bronzed; enjoy the rest of you day without feeling sticky. Option 1 – SUNSTYLE Bronze Solution is ideal for creating a naturally dark sunless glow using only the highest quality ingredients. This lightly fragranced quick drying formula will leave skin feeling smooth and moisturized while achieving instant and long lasting color. The Bronze solution should last 5-7 Days. Option 2– Sunstyle NEXT LEVEL solution Lasts 7-10 days and has more DHA to provide deeper darker results. Take your sunless tan to the NEXT LEVEL. This formula features increased DHA and cosmetic bronzers for those seeking the darkest, most natural sunless tan. Look like you been on vacation before you leave home. Private room – A comfortable private room to get a spray tan. No judgement or awkward conversations required. Automated booth – Great results every time. Just follow the step by step instructions, the booth will guide you through the positions for an even and consistent look. Please Read the article linked below on Spray Tan Prep to get the best results. Access to this level can be purchased as sessions, 30 day pass, or Annual Pass. Read the Preparing for a Spray Tan guide. Read the What to do after a Spray Tan guide. Come to the salon in loose fitting clothing, freshly showered with no perfume, Deodorant, or body spray. Need a tan for a special event or evening? Spray tans are a great alternative to a UV tan if you need color fast. Tan in minutes with easy to follow turn by turn instructions. Walk out with a beautiful tan. Automated spray booth means a perfect spray every time. Our booth is in a private room so you can get a tan without the tan lines. 4 levels of tanning so you can choose how dark you want to be. We only buy the highest quality tanning solution so you can be assured you will be TAN and not orange. Moisturizing spray helps extend and preserve your new tan. Moisturizing helps decrease the appearance of fine lines and wrinkles. Follow these steps to get the best spray tan results. Keep your Spray Tan looking great as long as possible. Clean clean clean clean clean, so very clean! "I have been going here off and on for 4 years, hands down the best place to tan. Staff is ALWAYS friendly and helpful... no matter how many questions I have. Clean clean clean clean clean, so very clean! I have tried other places in the past and left feeling like I needed a shower, not here Tan Elegance is always clean. Love this place." "Great Atmosphere! Beautiful & Clean store. I must say, Shane is definitely an asset to this business. I was a first time customer for the spray tan and he made me feel so comfortable. He was so knowledgable about the product. Nothing makes a business better than seeing a smiling face like his as you walk through the door. I will be back again!" Go get your one free tan!!! "I went to this salon for the first time today, and it was great. Clean, nice beds and the staff was very helpful and nice. Not pushy like some of the other salons I have been to. I tanned for free today because they offer one free tan just to try their beds. I live in Raleigh but found the salon because I was in the factory today, it's worth checking out. Go get your one free tan!!!" The staff is friendly and the salon is spotless. I enjoyed tanning there as I have severe psoriasis and they honored my Drs prescription for longer tanning time, due to my busy schedule it was easier for me to buy a tanning bed. I miss going and I would recommend this tanning salon to everyone . The staff is friendly and the salon is spotless. They always make you feel welcome. "Very friendly staff. They always make you feel welcome. Tanning beds are in excellent condition and facility always clean." "I'm leaving for a vacation in a week and was in desperate need to fix my pasty skin. I had an amazing experience at Tan Elegance in Wake Forest. Fantastic prices (I did some shopping around), very very clean and the girls at the front desk were super helpful with me being a newbie. They helped me choose the right bed and very patiently walked me thru how to use the bed and helped guide me on the length of times so I would not burn and get the best tan in my limited time. Being a male this isn't something that I normally do. This is a first class experience, they even leave an Andes mint in the room which was a great touch. This place is great they made me feel super comfortable." Karen P.Very clean and great atmosphere. Came and tanned for the first time. Very clean and great atmosphere. It was busy when I arrived but the gentleman working got me in and out and made my first visit wonderful. I will definitely be back. Lacy Jones It is always very clean and well maintained. "The owner and staff are great, I never have any complaints. It is always very clean and well maintained. I just wish they had longer hours." Sarah MurryIt is very clean and I recommend this location to everyone! "I love this place! The staff is so sweet and friendly! It is very clean and I recommend this location to everyone!" Connie DentonWonderful place, clean and modern. "Wonderful place, clean and modern. Never had the spray tan before, but Sofia was the best,she walk me through the steps and what to expect. Loved it." "Love this place! Reasonable pricing, friendly people, great beds!" Connie MishI felt comfortable and secure while tanning. "If you want comfort, cleanliness, an amazing tan, in a beautiful environment, then this is the place. I felt comfortable and secure while tanning. The customer service was beyond compare and no product was pushed upon me." "Tan Elegance is the best tanning salon in the area. Phenomenal spray tans." If you love tanning do yourself a favor and try this place out. Clean rooms, staff is super friendly and helpful. Best color I've gotten from tanning anywhere. Easy to schedule appointments, walkin anytime they get you in quickly. Fast results, prices are good and great variety of different beds and products. Hours are good compared to a lot of tanning salons in the area. Only downside is the are hidden inside the factory in wake forest. If you love tanning do yourself a favor and try this place out."